It seems like no matter how far we have come in the world of modern dentistry the perception of the dentist has not changed much since the days of the old west where the barber put his foot in your chest and yanked out your tooth. Research by the British Dental Health Foundation suggests that visiting the dentist makes people more nervous than snakes or spiders.The research echoes a March 2011, Adult Dental Health Survey which revealed half of adults – especially women – were classified as having moderate to extreme dental anxiety. 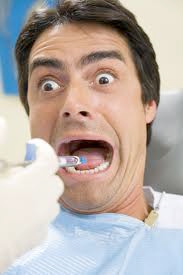 In a survey of 1004 people, the Foundation found what made them most nervous from a list including heights, flying, injections, doctors, snakes, spiders, going to hospital or visiting the dentist was visiting the dentist. Over one in five people ranked visiting their dentist as the thing that made them most nervous – more than any other category. In comparison to Physicians, Dentists also struggled. The Foundation discovered that nearly 10 times as many people (22 per cent) were made most nervous by their dentist, as compared to their physician (two per cent). The Adult Dental Health Survey points to two dental treatments in particular as the main cause of these nerves: three out of ten (30 per cent) adults said that having a tooth drilled would make them very or extremely anxious. A similar number (28 per cent) of people reported equivalent levels of anxiety about having a local anesthetic injection.